O.J. : Made in America, a five part mini-series produced by ESPN Films (home to the award-winning series 30 for 30), had its broadcast premiere earlier this summer. The documentary event, helmed by Peabody award-winning documentarian Ezra Edelman, marked a first for ESPN Films. The team relied on hundreds and hundreds of hours of footage mixed with current interviews from members of the trial, journalists, community activists, and friends of O.J. Simpson to carefully craft a narrative that not only tackles “the trial of the century,” but also race, violence, and celebrity worship in the United States. The result is 7.5 hour documentary that immediately draws you in thanks to its story, editing, and pace. We recently sat down with Seth Buncher, Finishing Editor for Post Factory NY (a SIM Group company), to learn what it took to create the mini-series and how Boris Continuum Complete played a major role. Congratulations on O.J. : Made in America…Can you tell us a little bit about Post Factory’s involvement? Seth: Thanks! It's really been an honor to work on such an important project. Post Factory has been involved from the very beginning. Before the first cut was made, we were deep in discussion about best workflows and practices. They cut upstairs from us so there were ongoing conversations between our producer Cristina Esteras-Ortiz and their whole crew. I must confess that I didn't truly understand the scale of the project until I really started working on it. 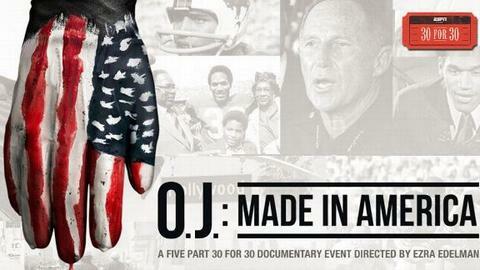 This isn't really a story about O.J. Simpson the football player accused of murder; it's a story about race, class, gender, police, and ultimately power in America. I also have to admit that I almost completely ignored the O.J. drama as it unfolded at the time. I knew virtually nothing about the events. But Ezra Edelman was able to tell this story in a way that's visceral, that's engaging, and that's relevant. There aren't many 7.5-hour documentaries that can grab a viewer and never let go. Ezra is amazing. He knew exactly what he wanted it to look like. He had a vision and it was up to us to get that on screen. Finishing was very personal for him. At what stage did you become involved as the Colorist and Finisher? Seth: The show had an unorthodox timeline. It was originally scheduled to air in June 2016 on ESPN as part of their fantastic 30 for 30 series, which gave us plenty of time to manage the immense project. In December, we found out that it had won admission to screen at the Sundance Film Festival in January, just 5 weeks away. Our schedules were shredded. We started work almost immediately. Miraculously, O.J. : Made In America made it to Utah. What were the biggest challenges in delivering a project on this scale? Seth: Obviously media management was an issue given the sheer volume of footage. The editorial team was absolutely outstanding. About two-thirds of their footage was archival, coming from every source imaginable. 320x240 QuickTime movies, Super 8, 16mm, Super 16, 35mm, DVCam, NTSC, PAL and every flavor of HD. Their interviews were shot 2k. So, basically, everything. And although we were always mindful of multiple outputs that we would ultimately deliver, we were laser-focused on the theatrical release in January. We ended up with 50 separate outputs for different festivals, networks (including ESPN and ABC), and distributors. One real challenge was that every DCP, every QuickTime, every single output had to be QCd. Looking out for a one-frame screw up on a multi-delivery, more than 50 times, is difficult. Why did you choose to use Avid for finishing? Seth: I believe in "horses for courses." Given the immense scope and accelerated schedule, this was definitely a job for Symphony. I didn't have time to do the uprez on one system, then color on another. The offline was cut on Avid so there was no translation. With the ability to grade based on relationships, reformat, motion adapt, and also title, blur, grain, etc. all in one timeline, it was a no-brainer to finish in Avid. We had multiple systems running virtually around the clock so Avid's collaborative ecosystem was huge. When Avid couldn’t handle a clip, plug-ins got called off the bench. Having BCC tools available right from the effect palette was tremendous. Were there any very challenging fixes or shots that required extra attention? Seth: Ha! There were many. They were sourcing material from any and every source imaginable. We'd get what looked like Super-8 that had been transferred to 29.97 video, then dubbed to PAL, before sending us an HD 29.97 file that ended up in a 23.98 timeline for 720p delivery. But of course we had to figure that all out on the fly, shot by shot. BCC's Image Restoration tools along with Avid's motion and cadence adapters were relied on extensively. Which BCC Image Restoration tools did you use the most? Seth: The most? That's a tough one. For this job, we relied on BCC to salvage problematic material. We used BCC's De-interlace, Flicker Fixer, Noise Reduction, and Match Grain. BCC allowed me to keep the audience enthralled in what is ultimately a fascinating story. Are there any specific shot examples in which BCC came to the rescue? Seth: They shot a ton of drone beauty shots of Los Angeles. The footage looked absolutely magnificent. But before it got to me, the cadence was just wrecked. Skipped frames, duplicated frames, everything. But Los Angeles is one of the main characters in the story and it was simply imperative that these shots look great. BCC De-interlace totally saved my bacon. What is your favorite new feature in BCC 10? Seth: mocha within Avid! Roto/matting effects and then adjusting them using the best tracker in the business is an amazing advance. The Beauty Studio is also a handy new suite of effects and the ability to use them with mocha is wonderful. Would you recommend Boris FX to other post-production colleagues? Seth: Absolutely! Only a madman goes into a gunfight with a pocket knife. BCC's Image Restoration tools are worth the price of admission on their own. Learn more about Post Factory NY. Download a free trial of Boris Continuum Complete 10.